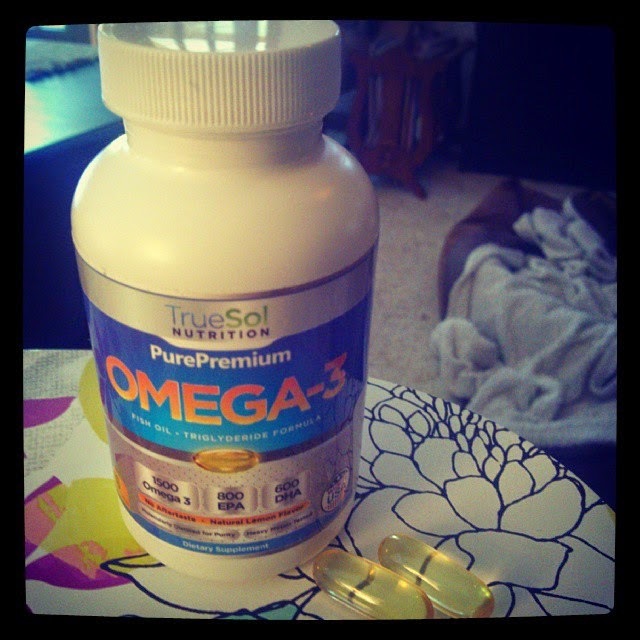 True Sol's Omega 3 Fish Oil supplements contain essential fatty acids that are important for health and wellness. They are triple strength with 1500 mg Omega 3 and an enteric coating for optimal absorption. So what do essential fatty acids actually do? They can promote heart health, increase brain function, reduce inflammation, improve mood, and promote skin health. Of course some of these benefits are harder to actually feel than others, but so far after taking this supplement for a couple weeks, I have noticed that my overall sense of well-being has improved. I feel more energetic and balanced, and less stressed. And I've noticed my hair and nails getting stronger and shinier too, which may be another benefit. But mainly, I just feel good knowing that I am doing something good for my health. I do believe these are great for hearth health and I know many doctors recommend Omega 3's. These capsules are large like most Omega 3's, but I take one at a time so I can swallow them easier. They also don't leave any fishy aftertaste, which is awesome! I haven't noticed any negative side effects taking these either. They are made in the USA with mercury-free sustainable fish oil.